Last night, we witnessed a heroic performance from Max Lee, who played through the entire fifth game with cramps on his legs. It was a gladiatorial performance from the world number 17 from Hong Kong, who defied all odds to walk out the winner. However, the match took its toll and Max came out a battered man, suffering from severe dehydration and cramping from the physical contest and the hot conditions in the court. He was rushed to the hospital to seek treatment and he is now in a stable condition. It is unfortunate that Max Lee is unable to recover in time to be match for tonight's final against England's Daryl Selby and will concede a walkover. We wish Max a speedy recovery and by default, congratulations to the 2016 Macau Squash Open champion Daryl Selby. An exhibition match between our champion Daryl Selby and Max's compatriot, Leo Au will be played at 7.30 p.m. local time right before the women's final. All eight top seeds across the Men's and Women's draws at the 2016 Macau Open came through their last eight encounters in style today to secure their place in the semi-finals of the PSA M50 and W50 tournaments and earn the right to compete on the stunning all-glass court situated beside the Macau Tower. Fresh from the tournament of his life on home soil at the Hong Kong Open last month - the first PSA World Series event of the season - defending Macau Men's champion Max Lee kept his defence alive with an impressive 3-1 victory over Ivan Yuen of Malaysia - who had taken out another of Hong Kong's top player Tsz Fung Yip yesterday - to set up a semi-final match with top seeded Marwan ElShorbagy. "He just tries for winners from everywhere, so I just had to play a patient game and pick up whatever he threw at me," said Lee afterwards. In the bottom half of the Men's draw Saurav Ghosal emerged triumphant in an all-Indian battle with best friend Harinder Pal Singh Sandhu, coming through a close 3-1 encounter after 64 minutes. Ghosal will now play England's Daryl Selby in the last four while another domestic battle in the Women's event saw Annie Au produce an emphatic win over fellow Hong Kong star Joey Chan to move through to face England's Emily Whitlock. Women's top seed Joelle King then came from behind to down Danish star Line Hansen in a hard fought four games to meet Delia Arnold in the semis. “I thought Line played very well," said King. "It’s probably the best she’s played against me. Malaysian World No.53 Ivan Yuen bridged a 28-place World Rankings gap to defeat Hong Kong’s Leo Au at the 2016 Macau Open and reach the quarter-final stage of a PSA M50 tournament for the first time in his career. Despite being ranked below fifth seed Au for much of the past five years, Yuen led the head-to-head record 3-1 coming into the duo’s Macau Open encounter, and the man from Penang came out on top once more, with an 11-9, 9-11, 11-7, 11-3 victory in 72 minutes seeing him progress to the last eight. Yuen will line up against defending champion Max Lee for a place in the semi-final after Lee overcame Tsz Fung Yip by a 3-1 margin. Swiss number six seed Nicolas Mueller was the other seeded player to bow out on the first day of main draw action in the Men’s event after he lost out to Indian qualifier Harinder Pal Singh Sandhu 3-1. A quarter-final meeting against compatriot Saurav Ghosal awaits Sandhu, with Ghosal seeing off Elvinn Keo in straight games to seal his place in the next round. Meanwhile, pre-tournament title favourite Marwan ElShorbagy got off to a winning start, recovering from a game down to defeat Australia’s Rex Hedrick, and the Bristol-based World No.7 will lock horns with Scotland’s Alan Clyne, who overcame English qualifier Joshua Masters in a five-game contest. England’s World No.19 Daryl Selby and Malaysian No.1 Nafiizwan Adnan will clash in the other quarter-final fixture after they achieved respective triumphs against Welshman Joel Makin and wildcard Steven Liu. Elsewhere, Egyptian qualifier Mayar Hany dispatched compatriot Heba El Torky in the Women’s event to set up a quarter-final meeting with Malaysia’s Delia Arnold, who eased past wildcard Liu Kwai Chi. There were also first round wins for the likes of Joelle King, Annie Au and Emily Whitlock. King downed South Africa’s Siyoli Waters to set up a fixture with Denmark’s Line Hansen, while Hong Kong’s Au defeated France’s Coline Aumard to ensure that she will play compatriot Joey Chan. Whitlock, meanwhile, stormed to victory against Egyptian 16-year-old Hana Moataz and will contest her quarter-final match with Australian No.1 Donna Urquhart. 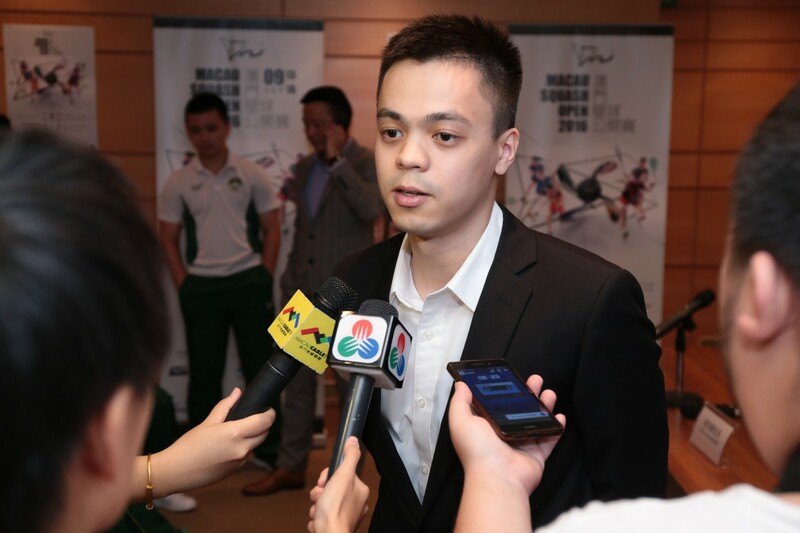 28-year-old Elvinn Keo struck a winning blow as he overcame a gap of almost 30 places on the World Rankings to down Australian Joshua Larkin in straight-games during the final round of qualification at the 2016 Macau open and secure a berth in the main draw of the M50 tournament – the first time the Malaysian has ever reached the main draw of an event biggest tan M25 in stature. Keo played with control and precision as he saw of Larkin 11-6, 11-6, 11-5 and will now face number two seed Saurav Ghosal in the first round. “I’m on cloud nine inside,” said Keo. “This is my biggest win and the first time I’ve ever mad ether main draw of a M50. I’ve won some M5 and M10 events but this beats them all. Ghosal is also joined in the main draw by compatriot Harinder Pal Singh Sandhu after the 27-year-old from Chennai came through a gripping five-game battle with James Huang while Joshua Masters and Joel Makin also came through their qualification encounters, with Makin set to lock horns with England’s Darly Selby just one week after their thrilling quarter-final encounter in the Open International de Squash de Nantes. In the women’s qualification Egyptian trio Mayar Hany, Nada Abbas and Hana Moataz dominated their encounters to end the charge of home hopes Bubble Lui and Chan Sin Yuk, restively, while Moataz cruised past South African Cheyna Tucker. Siyoli Waters, however, ensured South African representation in the main draw after she defeated Hong Kong’s Carmen Lee in 20 minutes to set up a first round battle with top seeded Joelle King in what could be the encounter of the round. The opening day of qualification encounters at the 2016 Macau Open saw local hopes Bubble Lui and Chan Sin Yuk upset the seedings to earn surprise berths in the qualification finals and move to within one victory of a place in the main draw of the W50 and M50 tournaments. Lui saw off the challenge of South Korean Yura Choi, coming through in four games, to set up a deciding battle with top seeded Egyptian Mayar Hany while Chan Sin Yuk also halted Egypt’s Farah Momen, sister of Men’s World No.11 Tarek, in four games to move through and meet Nada Abbas for a place in the main draw. In the Men’s event there was no such joy for local hopes as Henry Leung, Leung Teng Chi, Manuel Chan Gassmann and Van Keng Hei all bowed out at the hands of superior opposition, with World No.72 Joshua Masters of England leading the charge with a straight-games victory over Leung. Malaysian Elvinn Keo, South Korean Ko Youngjo, Chi Him Wong of Hong Kong and Taiwan’s James Huang will however keep regional interest alive after they all progressed. The draws for the 2016 Macau Open, PSA M50 & W50 tournaments have been released with World No.6 Marwan ElShorbagy and World No.9 Joelle King named the top seeds in the Men’s and Women’s events, respectively, ahead of the start date on Thursday September 15. ElShorbagy, who plays Australia’s Rex Hedrick in round one, is coming off the back of a superb season that saw him win two PSA World Tour titles in addition breaking into the world’s top 10 and the Egyptian will look to improve on the quarter-final finish he managed at last year’s tournament. Bristol-based ElShorbagy is seeded to meet Indian National Champion Saurav Ghosal in the final, but will need to battle through a highly competitive field that could see him come up against defending champion Max Lee, who ended ElShorbagy’s tournament last year, in the semi-final stage. Ghosal, meanwhile, makes his first appearance at this tournament since 2014 and the World No.17 opens up against a qualifier, while the likes of World No.32 Nicolas Mueller and World No.20 Daryl Selby could lie in wait for the man from Kolkata in the quarter-final and semi-final stages, respectively. World No.224 Steven Liu will be flying the flag for Macau and the country’s number one player has been named the tournament wildcard. The 22-year-old faces Malaysian No.1 Nafiizwan Adnan in the opening round. Elsewhere, King is the pre-tournament title favourite in the Women’s event, with her nearest challenger likely to be second seed Annie Au, who this month returned to the world’s top 10. King could come up against the dangerous Emily Whitlock in the quarter-final, while World No.17 Delia Arnold, who begins her tournament against wildcard Liu Kwai Chi, is seeded to meet the New Zealander in the last four. Au also has a difficult path to the final, with the likes of World No.20 Joey Chan and former World No.2 Jenny Duncalf competing on her side of the draw. The Macau Open 2016 returns to the PSA World Tour calendar once again, running for the fifth consecutive year since 2011. The 2016 edition will offer $50,000 on-site prize money and bonuses in both the men’s and women’s categories. Association with support from the Macao Sports Bureau of Macao SAR Government. Egypt’s world number 7 Marwan Elshorbagy and India’s world number 21 Saurav Ghosal leads the pack in the men’s event. Defending champion Max Lee of Hong Kong is the third seed and will be looking to continue his great start to the season after reaching the semi-finals of the World Series Hong Kong Open last month. England’s Daryl Selby, who will be playing in his second Macau Open, complete the top quartet. In the women’s event, Joelle King of New Zealand returns to Macau as the top seed ahead of Hong Kong’s Annie Au in second spot. The top seeded pair met in the quarter finals of this event a year ago with the Hong Kong number one coming out victorious. World numbers 18 and 15 Delia Arnold of Malaysia and Emily Whitlock of England are seeded 3 and 4 respectively. Local challenge at the event will once again be spearheaded by siblings Steven and Ivy Liu, the national champions of Macau who will both face Malaysian opponents in Nafiizwan Adnan and Delia Arnold. Teng Chi in the men’s. The qualifying rounds will take place on the 13 and 14 September 2016, with the main draw matches following from 15 September 2016 onwards at the at the Bowling Centre located at Avenida da Nave Desportiva. The semi finals and final, will be played at the glass court that will be erected on Praça Do Lago Sai Van. The Macau Squash Open 2016 press conference was held earlier today where the draw was officially released to the local media. 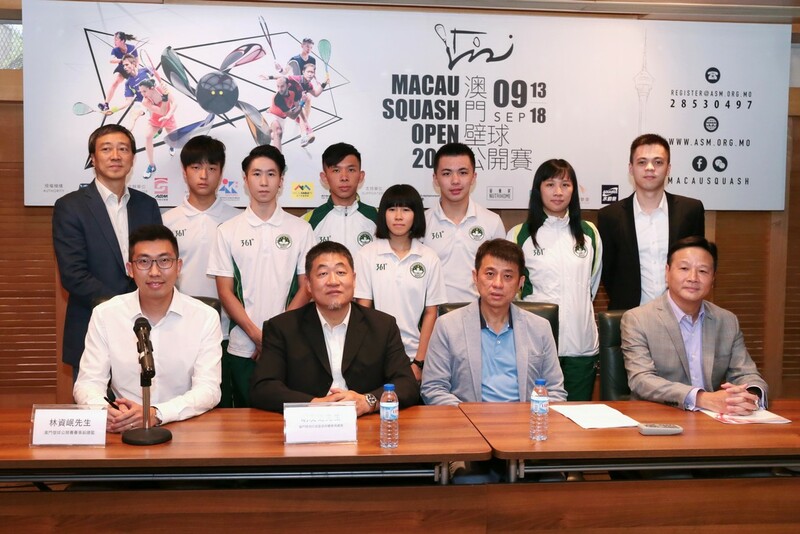 Present at the press conference today were Mr. Wu Lao Ut (Head of Sport Development, Macau Sports Bureau), Mr. William Kuan (Chairman, Macau Squash Association), Mr. Victor Hoi (Vice President, Macau Squash Association), Mr. Kenneth Lei, the tournament director, and assistant tournament directors, Mr. Armando Amante and Mr. Lim Chee Ming. In conjunction with the 2016 Macau Squash Open, there will be a Macau Squash Charity Carnival held at the Praça Do Lago Sai Van on 17 and 18 September between 1 -6 pm before the matches in aid of the Macau Autism Association. The Macau Squash Open 2016 is sponsored by the Macau Sports Bureau and supported by the Melco Crown Entertainment, Contribuild Group, Nutrihome, Macau Clothing and Coca-Cola Beverage Company Limited Macau.